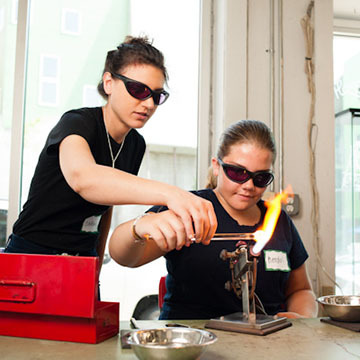 One of our principal goals at Pittsburgh Glass Center is education. We teach others about the incredible beauty, versatility, and science of glass in order to foster appreciation of its many creative possibilities and advance the culture that has developed around it. 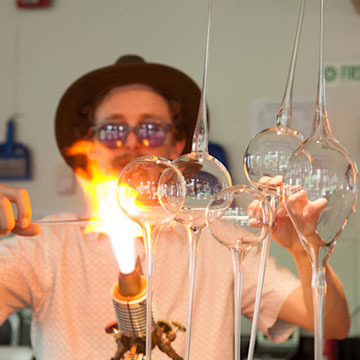 Explore our many educational options, which range from 15-minute Make-It-Now workshops—if you want just a taste of the glassmaking experience—to full 8-week courses and summer intensives—if you seek in-depth experience and specialized skills. Classes are taught by local and international glass artists who provide superior guidance and demonstrate safe and effective studio practice as you build your skills. Unless otherwise noted, you must be at least 14 years old to take a class or workshop at Pittsburgh Glass Center. For more information see our class policies here. Try glassmaking in 15 minutes or less! * PGC’s Make-It-Now workshops are an opportunity to try glassmaking in 15 minutes or less. No experience is necessary. Make-It-Now is intended for groups of four or fewer. If you have a larger group, private workshops are available. *Please note that due to the nature of hot glass, items cannot be taken home the day they are created. They must cool first and may be picked up a few days later. Shipping can be arranged for an additional fee. Our introductory workshops are the perfect way to sample the many different processes and techniques. Experienced artists and instructors lead the workshops, and all materials are provided. Class sizes are small so that you receive individualized attention. Workshops are also a fantastic group activity, so gather your book club or a bunch of friends and sign up together. Don’t be intimidated! No experience is required. Simply pick a workshop, roll up your sleeves, and get started. Unless otherwise noted, you must be at least 14 years old to take a workshop. Are you hooked yet? In addition to short introductory sessions, we offer 8-week classes for all experience levels, from beginners through advanced students. Unless otherwise noted, classes meet in 3-hour sessions. In each session, you’ll see demonstrations of the skills you will be learning and practicing that session, followed by hands-on application for the remainder of the class. In each session, you’ll have the chance to perfect your skills and work one-on-one with your instructor. Classes are small so that you receive individualized attention and regular instructor interaction. Apply for a scholarship here. The top glass artists from all over the world come to Pittsburgh Glass Center each summer to teach and share their knowledge and experience with students of all abilities from newbie to ace. Our one-week intensive classes are the best way to perfect your technique. You get one-on-one time with world-class instructors and over 12 hours a day in our state-of-the-art studios to practice what you’ve learned. If you are traveling from afar you can find our more about nearby neighborhoods and lodging for your stay. Interested in a scholarship? Apply for a scholarship here. Si02 is a glass art program designed for young people. SiO2 shatters the conventional notion that glass art is only for adults. 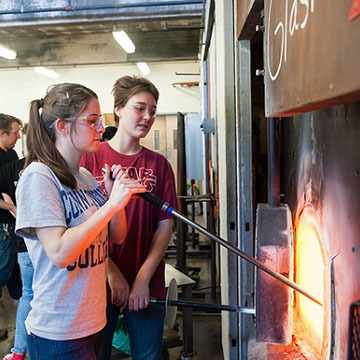 The program’s hands-on courses are structured specifically for young people and taught in one of the United States’ premier glass facilities. All four of our state-of-the-art studios are open for young adults to explore their creative potential and embark on an education in glass. 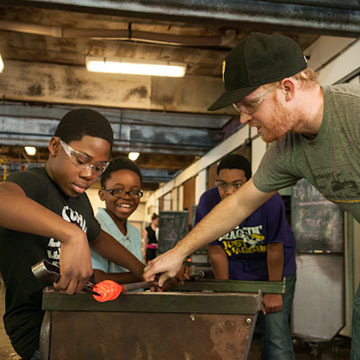 Pittsburgh Glass Center (PGC) offers one day workshops throughout the year plus 10- and 12-week after-school programs in the fall and winter and a one-week summer boot camp. Learn More about SiO2. 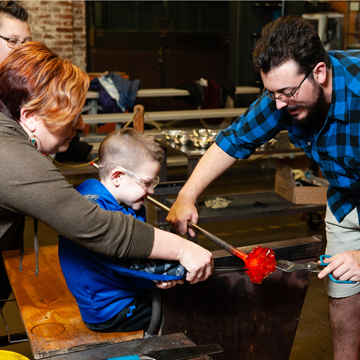 One-on-one lessons are perfect if you are anxious to start working with glass and can’t wait for a class to begin, or if your schedule precludes attending PGC’s planned courses. One-on-one lessons involve private, customized instruction in any aspect of studio glass art within any of our four studios. You receive focused attention from our experienced instructors and can move at your own pace. Beginners benefit by learning the basics and building a strong foundation. Experienced artists can expand their skill set by focusing on specific techniques. You design the program to fit your goals. Can I walk in and make something today? The majority of our classes and workshops are pre-registration only. 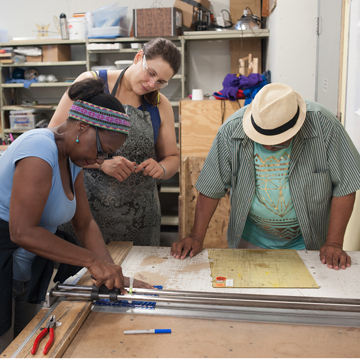 Many of our Make-It-Now classes are open for walk-ins. Check the the list here for the next Make-It-Now. How old to you have to be to take a class? You must be at least 14 years old to take a class or workshop; however, our Make-It-Now events are open to all ages. We also have classes for young people in grades 6 - 12. See the section on our website for Young Glass Students. Do you have any classes for young children? We have classes for young people in grades 6 - 12. See the Youth Programs section on our website. Also our Make-It-Now events are open to all ages. Will I receive a ticket for my class? Generally, no. For our larger events such as Date Night or Make-It-Now events, we will present you with a card when you check-in. This card will have information about pickup times and dates. All classes are located at 5472 Penn Avenue. There are four different studios within our building. Once you arrive, you will be directed to the appropriate studio. Can I complete the release of liability form before my class? Yes! Release of liability forms should be complete before your arrival to PGC to ensure all students may begin on time! Complete your release form here. Wear comfortable natural fiber clothing. Jeans and t-shirts are great. Wear flat close-toed shoes. Something with a textured sole isn't absolutely necessary, but certainly helpful. Anything that hangs away from the body (long necklaces, scarves, etc) should be left at home or removed before the class. Tie back long hair. Long hair is defined as anything that hangs forward or covers eyes. Can I take the items that I make home with me the same day as my class? Due to the nature of hot glass, you will not be able to take any items with you. Items can be picked up at the front desk 5 days after your activity or ask our front desk about shipping options. What do I need to pick up my items? Can someone pick up my items for me? Do you ship work that I made in a class? Yes, shipping can be arranged at the front desk after your activity. Charges will vary according to the size of your projects and the destination of your package. Items can take up to 2 weeks to be shipped. Why was my class cancelled? Unfortunately classes are occasionally cancelled because of enrollment and sometimes weather. If class is ever cancelled we will notify you immediately by email and phone. For this reason, it is important that you include your phone number when registering. You can purchase a gift certificate online or by calling the front desk at 412-365-2145. Free parking is available in our adjacent lot. Additional on-street parking is also available.